PROPERTY developer Bertam Alliance Bhd will launch three high-end projects worth a combined RM310 million in Selangor and Langkawi to ride out the economic downturn and remain profitable. The company hopes to maintain its 2008 earnings via locked in sales and income from the projects, its executive chairman Ng Sing Hwa said. For the year ended December 2008, Bertam made a net profit of RM5.5 million, up 28 per cent from 2007, on revenue of RM45.2 million. Bertam, (formerly, UH Dove Holdings Bhd), is launching up to 30 bungalow lots in Langkawi worth over RM20 million in June, Ng said. In July, it will launch Grand View, a gated and guarded community featuring 66 exclusive bungalows worth RM140 million (RM1.8 million to RM3 million each) in USJ1, Subang Jaya. By September, Bertam will launch 72 bungalows in Kota Damansara, worth RM150 million, or RM1.8 million to RM2.2 million each. Ng told Business Times after the company's shareholders meeting in Petaling Jaya yesterday that it is optimistic of selling the stocks within a year. "Our properties are in established areas. So long as you don't overprice, there will be buyers. As a developer, I am quite happy with 25 per cent to 30 per cent profit margins," he said, adding that Bertam will emphasise on building houses in small numbers to remain cash flow positive. It will also buy pockets of land from developers in choice locations instead of more than 40ha. "Landbank kills if you are not careful and are over geared. If you buy land of more than 200ha, you will be cashflow negative, unless you have been able to develop it by more than 50 per cent. We won't toy with that risk," Ng said. Ng added that Bertam will not lock-in a project that will last more than three years. "Housing is an industry, not a real estate development. We buy land and keep on moving. We do not speculate or keep stocks. We have the right products to sell. We emphasis on design and do not overprice," Ng said. Unfavourable market conditions have caused IGB Corp Bhd to delay two major projects with an estimated combined value of RM1.5 billion to RM2 billion. This will likely affect its property development division in the current financial year ending December 31 2009. Last year, revenue from property development fell by a third to RM169.97 million from RM252.48 million in 2007. The two projects on hold are the final third phase of the Mid Valley City and the high-end Stonor condominium in Kuala Lumpur. They could take off from next year. Nevertheless, group managing director Robert Tan Chung Meng expects the recent completion of its North Tower Offices and The Garden Residences to make up for any shortfall in that division. The group's performance this year is likely to remain flat, he said. IGB made RM172.87 million net profit on RM688.22 million revenue last year. It also made a gain from the sale of Gleneagles Kuala Lumpur of RM83.59 million. On its hotel division, which contributed a quarter of revenue last year, Tan said that IGB will open The Cititel Kota Kinabalu this year. The US$50 million (RM175 million) 550-room St Giles Makati in the Philippines, developed by associate company St Giles London, will be operational in the first quarter of next year. IGB is also in discussions for possible hotel projects in Bangkok, Thailand; Sydney, Australia; and Hanoi and Ho Chi Minh City in Vietnam. "We are talking to about 10 parties, some for joint-venture projects, some for management, and some to be wholly owned," Tan told reporters after IGB's annual general meeting in Kuala Lumpur yesterday. He said the group's 910-room Renaissance Kuala Lumpur is still on the market and that it was also willing to sell the MiCasa All Suite Hotel in Kuala Lumpur that is undergoing a RM50 million renovation. Tan said the asking price for the Renaissance is RM800 million and for the MiCasa, about RM200 million. IGB's first quarter results, released yesterday, saw net profit decline 7.6 per cent to RM33.9 million from RM36.7 million in the previous corresponding period. Better contributions from property investment and its hotel division helped revenue improve 2 per cent to RM165.6 million from RM162 million. KUALA LUMPUR: IGB Corp Bhd is in talks with 10 parties on developing hotels in Vietnam, China, Thailand and Australia. Group managing director Robert Tan said the development might be in the form of joint venture, asset management or to wholly-own the entity itself. “The hotels will carry the brand of either St Giles or Cititel but no deals have been closed at the moment,” he told a press conference after the company AGM yesterday. Tan said the talks were mostly focused on hotel development, while some deals might involve taking over and developing uncompleted buildings. “We have started the construction of St Giles Hotel in the Philippines and it is expected to be completed by the first quarter of next year,” he said. He said the hotel might be a 50:50 joint venture between IGB Corp and associate company St Giles London but the latter was currently financing the US$50mil project. The hotel division now contributes about 30% to IGB Corp’s net profit. Tan said the company had delayed a few projects, such as Stonor and Mid Valley Parcel 3, this year. “They carry a total gross development value of RM1.5bil to RM2bil,” he said. Stonor is a condominium in Kuala Lumpur while Parcel 3 is a commercial development. On talks of selling its Renaissance Hotel in Kuala Lumpur, Tan said IGB was still pursuing the deal and the asking price was around RM800mil. However, he said, it had not received any “serious” offer yet. He said IGB was also considering disposing its MiCasa All-Suite Hotel, which was currently closed for refurbishment and scheduled to open in October. “We are always open to offers. The value of the hotel will be about RM200mil after the refurbishment,” he added. PROPERTY developer MK Land Holdings Bhd has posted a net profit of RM13.2 million for the nine months to March 2009, against a loss of RM18 million in the same period last year, attributed largely to higher property sales. The improved performance has allowed MK Land to make an early payment of RM60 million as the final settlement of its outstanding bond, which is only due in September this year. MK Land, in which Tan Sri Mustapha Kamal Abu Bakar holds a majority stake, slipped into the red in the 12 months to June 2007 and 2008 due to additional cost incurred because of errant contractors. It was the period when Mustapha Kamal stepped down as executive chairman from April 2007. 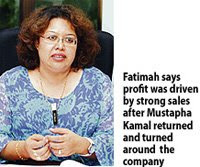 Chief operating officer Fatimah Wahab said the profit for the period reviewed was driven by strong sales performance after Mustapha Kamal returned and turned the company around in June 2008. Sales for the nine months jumped 180 per cent to RM185 million, in spite of the weaker property and economic market condition, Fatimah said. Top company executives have also mapped out a turnaround plan that includes cutting operating overheads, increasing cash position and reducing debt on a timely basis. "The early (bond) payment is a significant milestone for MK Land in its turnaround efforts. We have sent a message to our bankers, bondholders and other stakeholders that we are serious about our efforts to reposition MK Land," Fatimah said. MK Land will also embark on a corporate restructuring to lower the overall costs of funds and enhance earnings of share, she told Business Times. The group had debts of RM500 million as at December 31 2008 and aims to reduce this to RM400 million by June and RM300 million by early next year. "We will revisit the capital structure, treasury function and funding situation and see how they could be best structured to carry us forward. We have strategies in place to lower the cost of funds through innovative financial packages. We are talking to bankers," Fatimah said. She added that MK Land is looking at various ways to enhance its margins and banking on Armanee Terrace Condominium and Rafflesia, its two core products within its Damansara Perdana township in Selangor, to drive profits. WASHINGTON: Sales of previously owned US homes rose in April, a report showed yesterday, providing more evidence the housing market is stabilising and backing views the recession is nearing an end. The National Association of Realtors said sales climbed 2.9 per cent to an annual rate of 4.68 million as the traditional spring home-buying season swung into gear. However, the stock of unsold homes swelled 8.8 per cent to 3.97 million, the highest since November. Both the trade group and economists shrugged off the rise in home inventories as mainly the result of seasonal factors, with sellers taking advantage of spring to try and sell their properties. “Most of the sales are taking place in lower price ranges and activity is beginning to pick-up in the mid-price ranges, but high-end home sales remain sluggish,” NAR chief economist Lawrence Yun told reporters. The data appeared to have little impact on major US stock indexes, which were close to flat in early afternoon, but the Dow Jones Home Construction Index rose 2.3 per cent. “This report seems to offer another piece of evidence that home sales are stabilising,” said Zach Pandl an economist at Nomura Global Economics in New York. economic downturn, triggered by the collapse of the housing market, was easing and could well end by the third quarter, as a National Association of Business Economists survey published yesterday predicted. The pace of job losses slowed last month, claims for unemployment aid have come off their peaks and consumer confidence has risen from recent rock-bottom levels.